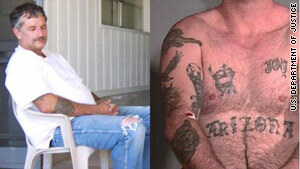 John McCluskey has tattoos on his arm, chest and stomach, as seen in these photos. (CNN) -- Frustrated Arizona officials seeking two fugitives released new clues Wednesday, saying one of them is missing a prominent tooth, while his alleged accomplice is missing most of her right index finger. Members of a task force spearheading the nationwide search for the last of the three escaped inmates, John McCluskey, and his alleged accomplice, Casslyn Mae Welch, hope the clues will help the public identify the fugitives. McCluskey is missing his left incisor, next to his left front tooth, Arizona State Prison officials said in a news release Wednesday. And Welch is missing almost half of her right index finger, which is evident because she smokes cigarettes with her right hand, the statement said. McCluskey, 45, was serving a 15-year sentence for attempted second-degree murder and other charges when he and fellow convicts Tracy Province and Daniel Renwick broke out of the prison July 30, allegedly with Welch's help. Province and Renwick are now back in custody. Welch, who was on the visitation list for one of the inmates, threw cutting tools over a prison fence, according to Charles Ryan, director of Arizona's Department of Corrections. The hunt for McCluskey and Welch is centered on western Montana and along the border with Canada, the U.S. Marshals Service said. The last credible sighting of the pair occurred August 6 in Billings, Montana, the marshals service said. A reward of up to $35,000 is being offered for information that leads to their arrests. McCluskey is believed to have dyed his hair dark and grown a beard, and Welch may have blond hair. "All information indicates McCluskey and Welch are still traveling together and should be considered armed and extremely dangerous," the marshals service said in a news release. "It is likely they are reacting, rather than taking deliberate action. As the manhunt protracts, it is highly possible they will become more desperate, creating increased danger to law enforcement and the general public. If they are encountered, call local law enforcement immediately." McCluskey and Welch are also suspected in the killings of a couple whose bodies were found in their burned-out camper this month in New Mexico, according to authorities. Authorities said they are probably driving a gray, gold or tan 1997 Nissan Sentra, though both are experienced semitruck drivers known to have frequented truck stops, rest areas and campgrounds. Ryan has noted some "operational security problems" at the prison. "Those are being evaluated and investigated as we speak," he said this month. Renwick, 36, was captured August 1 in a shootout with police in Rifle, Colorado. He was serving 22 years for second-degree murder when he escaped. Province, 42, was rearrested Monday in Meeteetse, Wyoming, near Yellowstone National Park, when authorities were notified by a local resident who sat and talked with Province a day earlier on the steps of a church in town. He was serving a life sentence for murder and armed robbery. Renwick remains in the Garfield County, Colorado, Jail on charges of attempted first-degree murder and eluding police, the U.S. Marshals Service said Sunday. Authorities are working to coordinate the transport of Province back to Arizona from Wyoming -- expected to occur within the next month, the marshals service said. Last week, a warden and a security official resigned their posts at the Arizona state prison where three inmates escaped, a spokesman for the private company that runs the facility said Sunday. Unit Warden Lori Lieder and an unidentified unit security chief resigned last week from Arizona State Prison-Kingman, according to Carl Stuart, a spokesman for Management & Training Corporation.